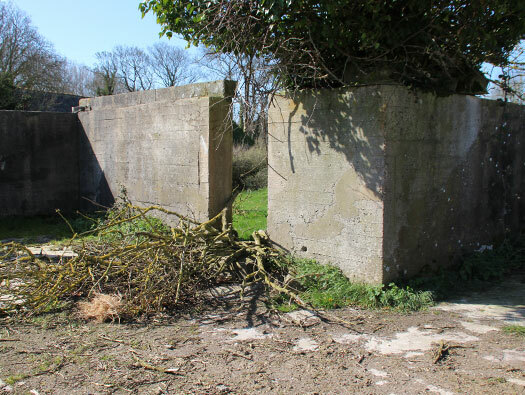 1943/1944 became Stp177a and Wn179. Airfield assigned code number 372. JG26 arrived with Me109s to come closer to England . 3 ------ squadrons of 12 109s, a total of 36 aircraft. 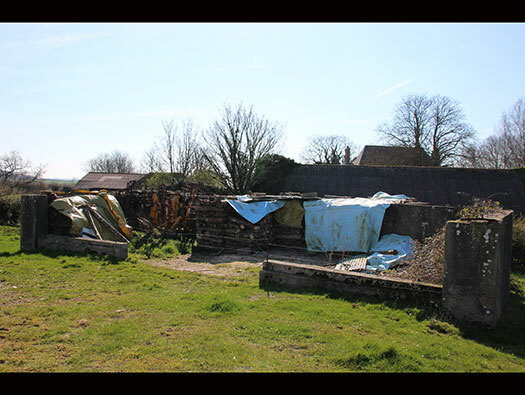 1 ------ Small hangar for repairs (removed). 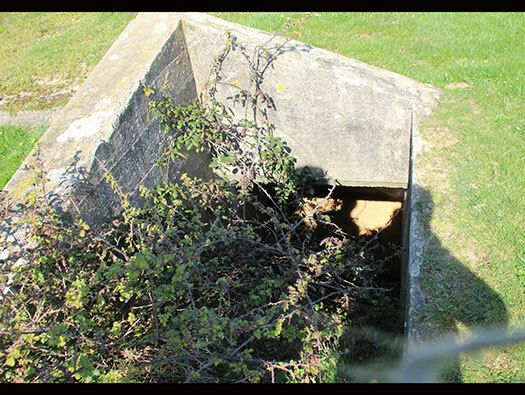 2 ------ Vf3 Observation/Machine gun bunkers. 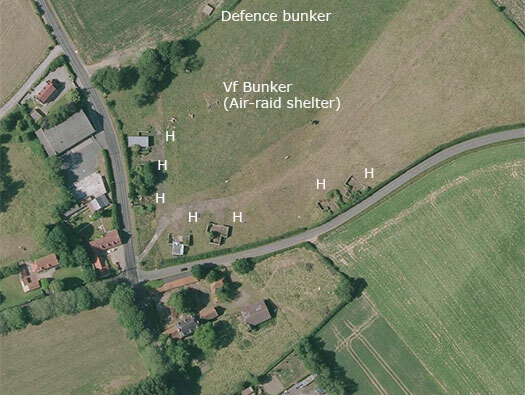 2 ------ Vf2a group bunkers. 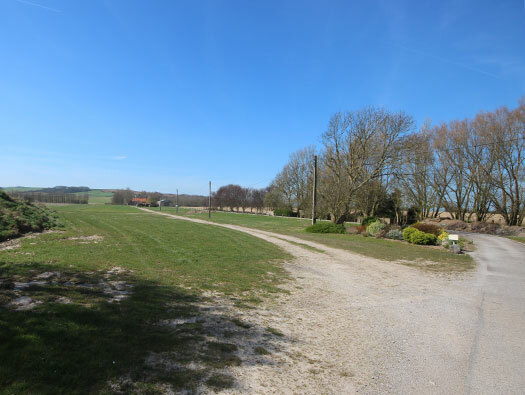 Yellow - the concrete taxiways used by the aircraft to get onto and off the all grass airfield. 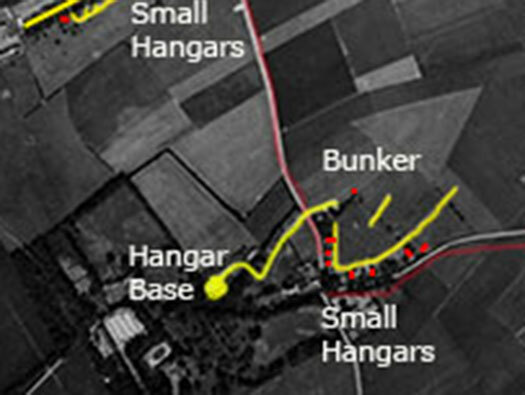 Red ---- Hangar bases and defence bunkers. 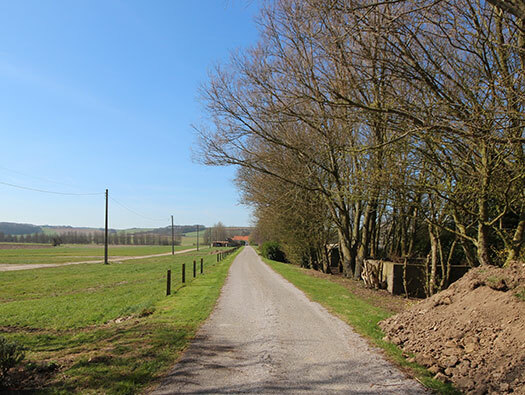 Audembert was originally a first world war aerodrome. 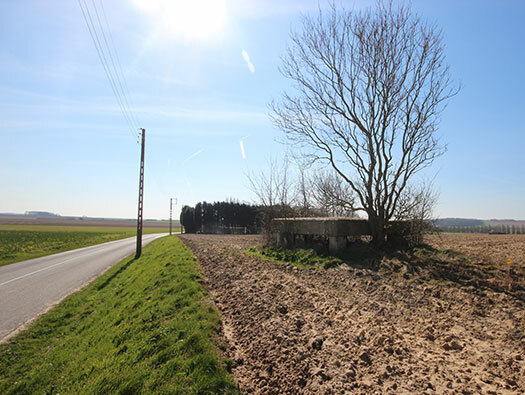 After the Germans very fast advance into France in WW2, the area was surveyed in July 1940 and it became a Luftwaffe fighter base for the Battle of Britain. 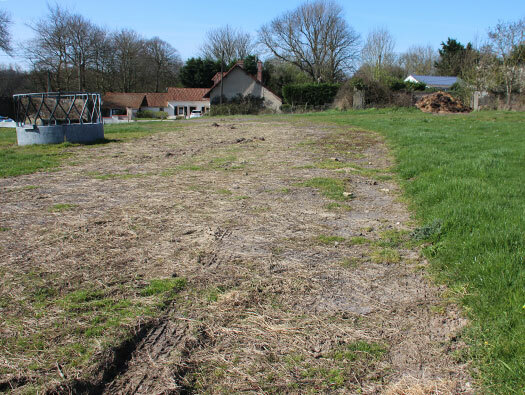 Two runways were laid out in grass. It was taken over by JG26 with Me109´s. VU174 Tillburg. 1 x HQ. 1 x Barracks. 3 x Vf2a. 2 x Vf3. 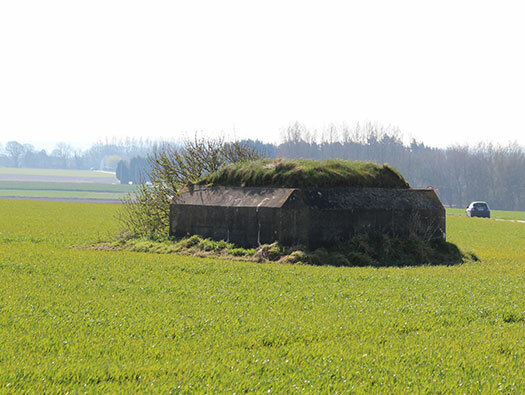 1 x Wasser bunker. 5 x Hangars. 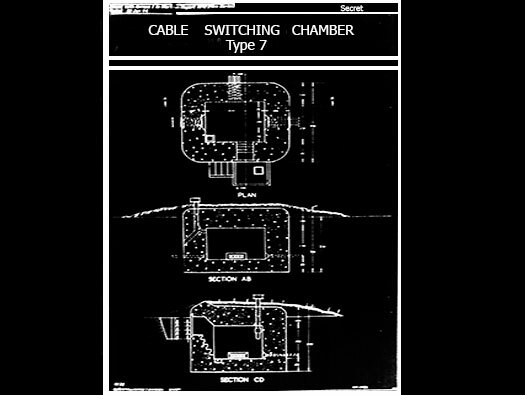 1 x KSS (Cable bunker). VU177 Paladin. 7 x Hangars. 1 x Vf2a's. 1 x Vf3. 1 x Zisterne. 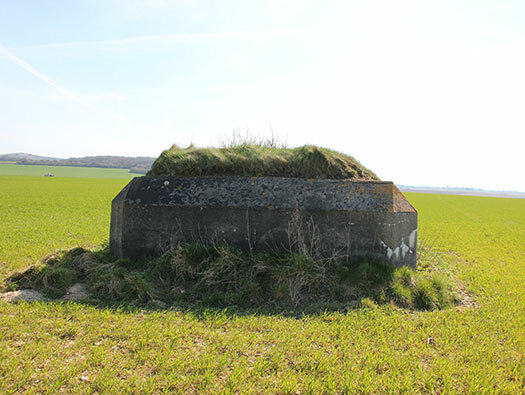 1 x Air-raid shelter. 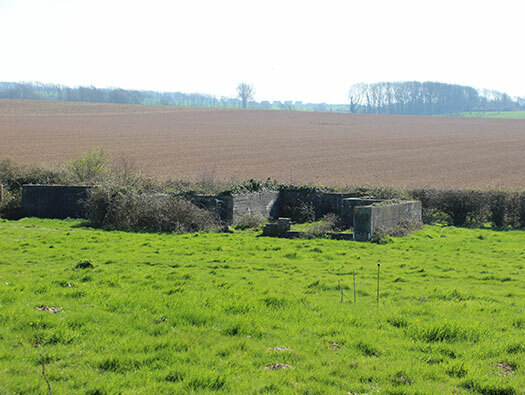 1 x Large Hangar (removed). 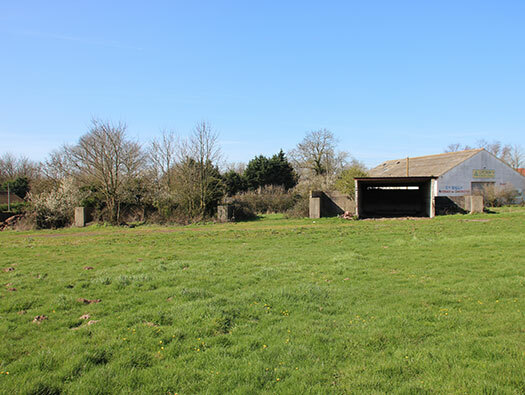 Single aircraft hangars, also double as bomb proof pens if earth is placed around the outside. 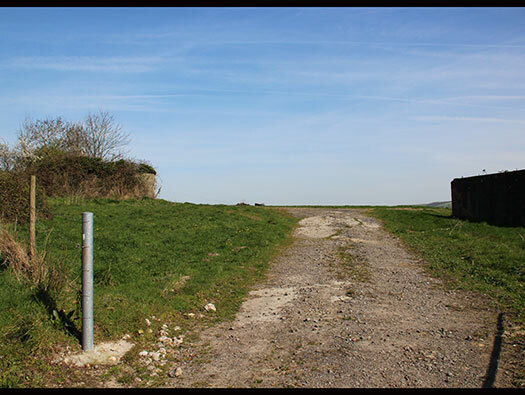 The entrance into the airfield. 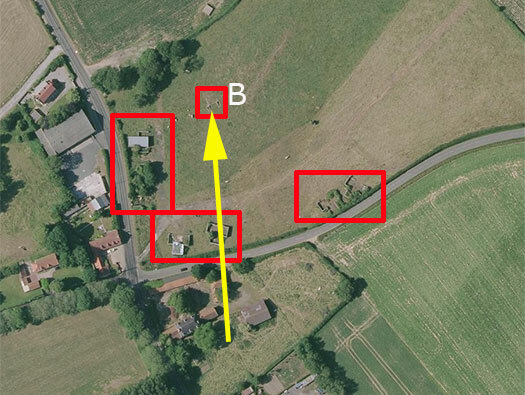 The layout of the south side of the aerodrome with seven Verteitigungsunterkunft (Defence accommodation for fighter) pens/hangars. Me Bf109 E engine repairs. Galland next to his Bf109 F2 with two 20mm MGFF guns in the wings. 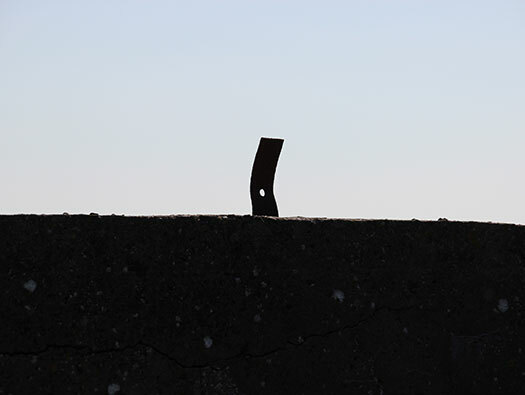 Metal fitting on the wall to hold a timber support for a building above. 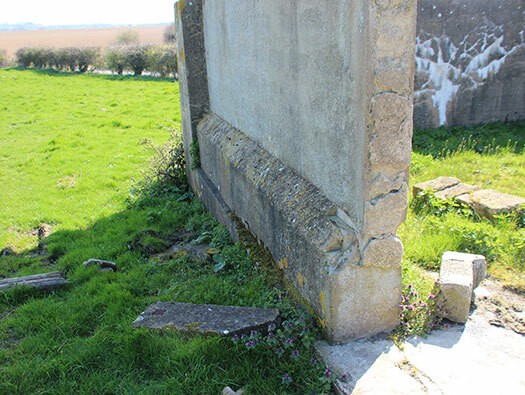 This could be a defence embrasure for the hangar. 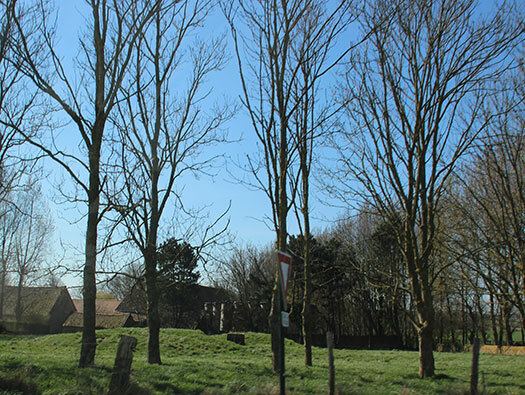 Three on the western side. 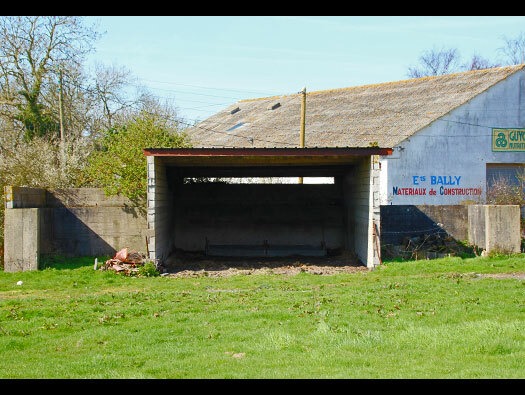 This one now a farmers shed. 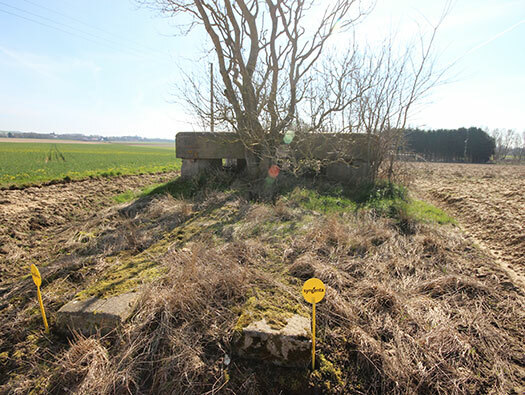 You can just make out the Wasser bunker. Water tank. 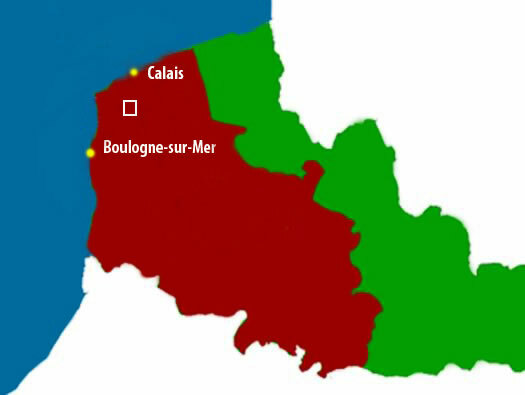 This is how they would have looked. 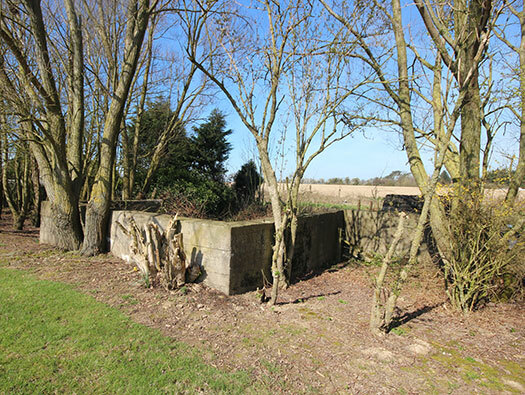 Vf2a group bunker but here I would say used as an air-raid shelter. 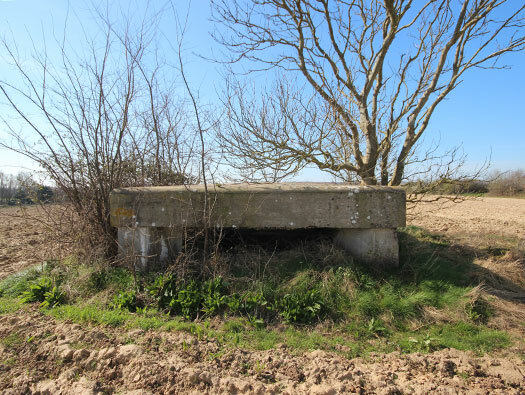 I think this maybe a Vf2 bunker. 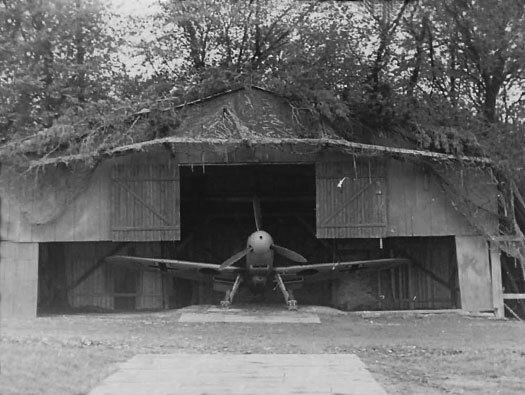 Vf2a with a modified entrance layout. 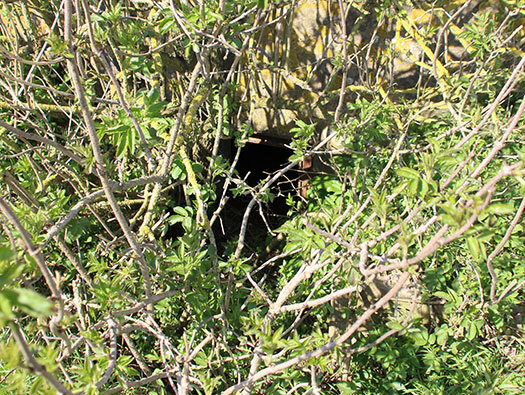 Vf2a one of the two entrance ways. Vf2a looking down into the entrance. 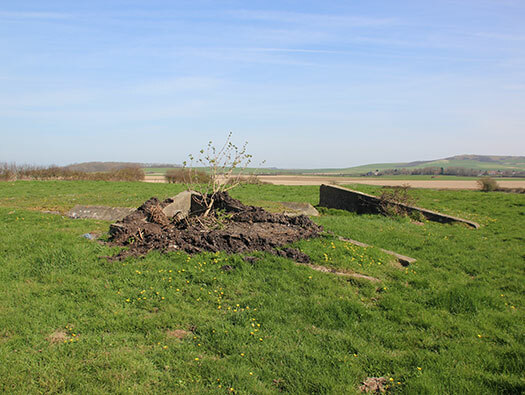 There was also a hangar of some kind behind the farm now just a concrete pad that the farmer uses. Ah! 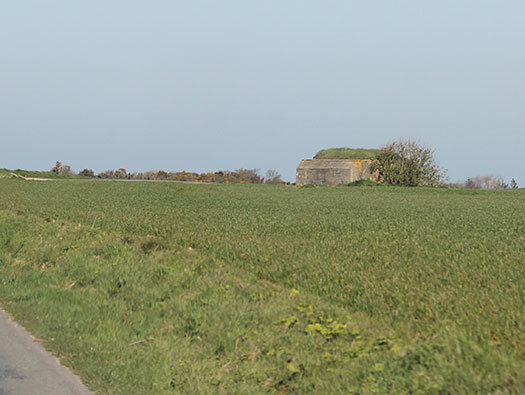 a bunker - but no it turns out its an ancient burial mound. 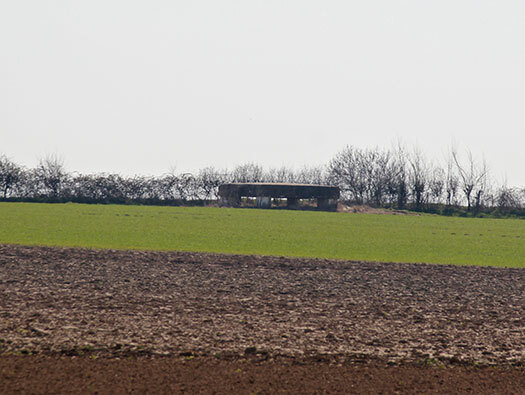 Not a defence bunker but a KSS Kabelschalt Brunnen (Cable connection bunker). This looks like an cable exits. 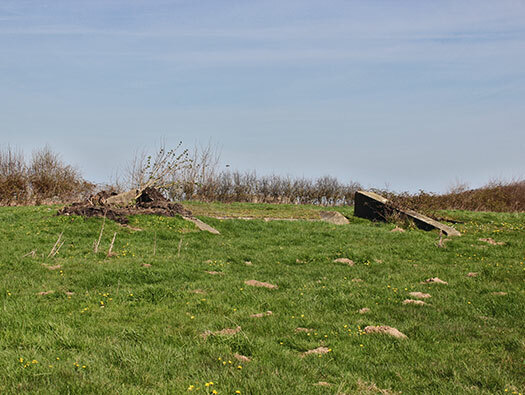 This is in the north side of the farm and looks like a defence position. 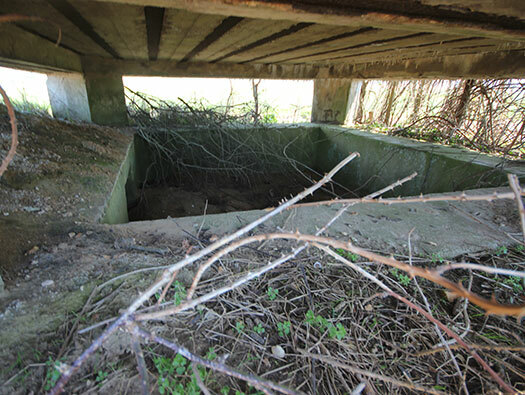 A Google image of entrances into the bunker and does look like another Vf2a. 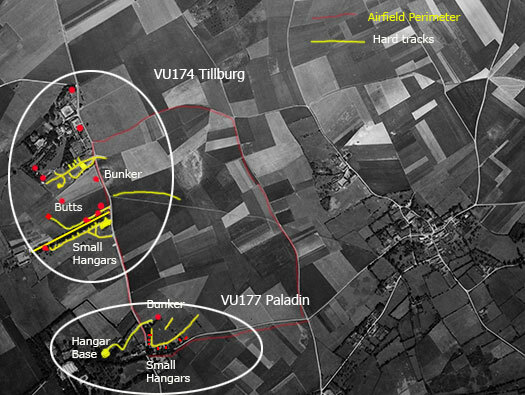 Plan of the Vf2a here. 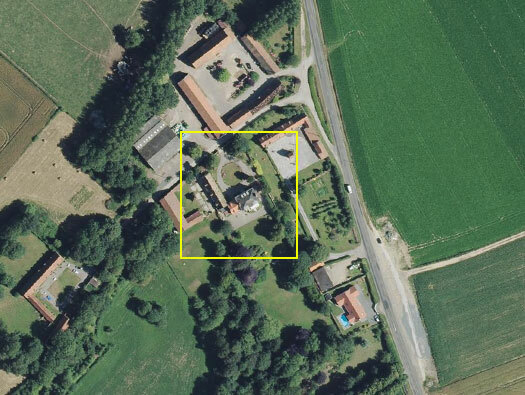 The large white house at Le Colombier was used as Galland's HQ for the staff of JG26. Werner Mölders and Adolf Galland in the grounds of the house. 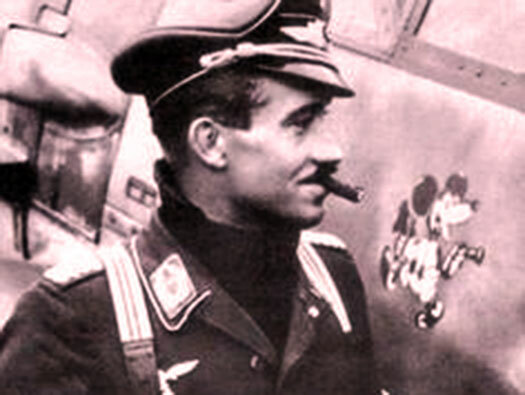 Adolf Galland and his petite chienne mascot of JG26. Galland and Mayer just before take off. Galland and Osterkamp discussing battle tactics in the Officers Mess. 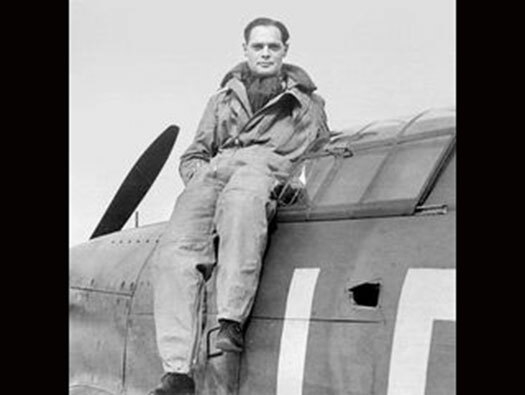 Douglas Bader was a pre war RAF pilot. Whilst practicing aerobatics one day in a Bristol Bulldog fighter, it crashed and he lost both his legs. WW2 started and Bader by then medically discharged from the RAF asked to re join as a pilot. 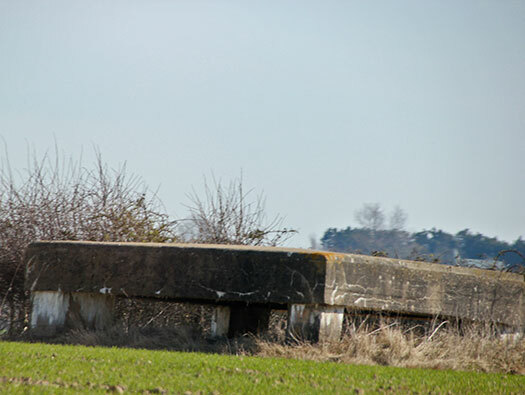 By 1941 he was Acting Wing Commander of 12 Group’s “Big Wing” at RAF Tangmere. On 9 August 1941, Bader was shot down while flying his Supermarine Spitfire Mk Va, serial W3185, marked “DB”, along the coast of France. His prosthetic legs caught in the cockpit and made it difficult for him to escape, but he finally broke free and parachuted to safety. Galland finding out that Bader was in the area had him brought to his Officers Mess where he stayed a few days before going to a Prisoner of War Camp. 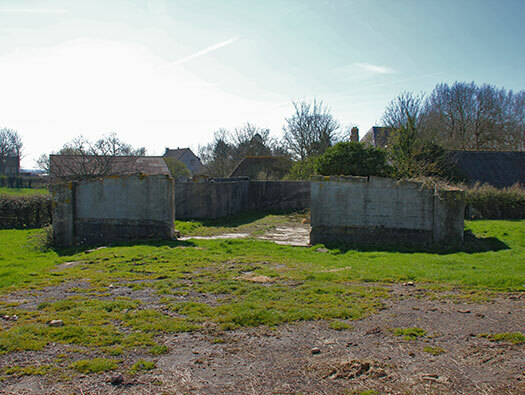 Bader was not a good prisoner and later was sent to the notorious Colditz Castle POW camp for trouble makers. Bader with members of 242 Squadron, RAF Colitshall..
Bader being presented to Galland and other officers at the house at Le Colombier. Bader walking out into the garden at Le Colombier. Bader in the middle at Colditz Castle in captivity..
Vf3 Observation, defence position. 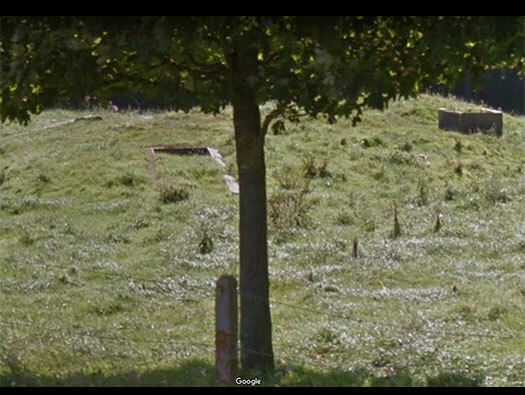 There is an exit tunnel in the left side. 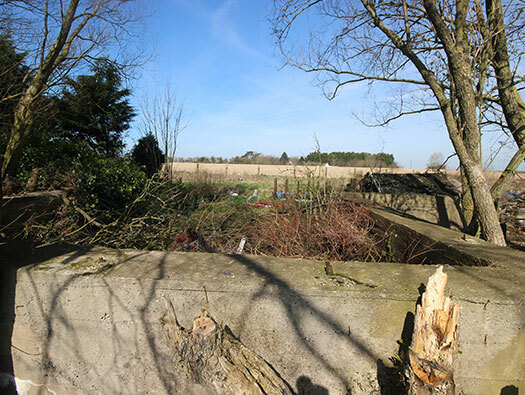 Vf3 Observation, defence position. 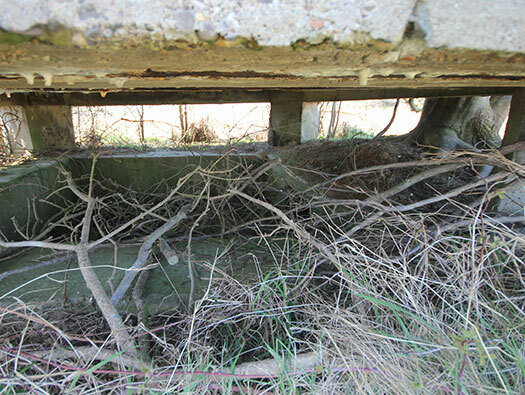 Entrance trench into the bunker. Aircraft taxiways running off the airfield. 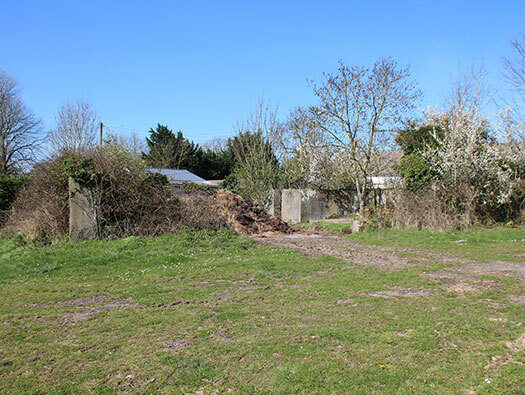 Fighter hangars on the right and at the end of the drive one more turned into a garage for the farm. 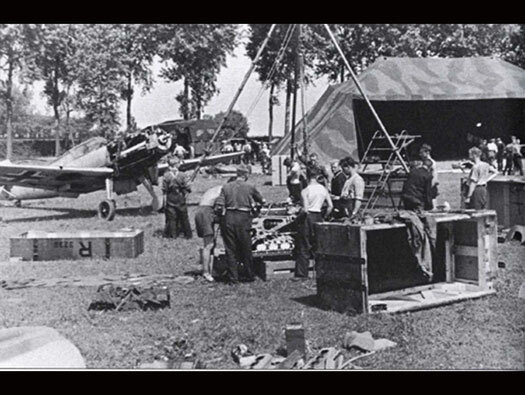 Galland´s plane being re fuelled. How a damaged Me109 was towed away for repair. Shooting in Butts. This is where a plane sits on a concrete pad, fires & adjusts its cannon & machine guns. 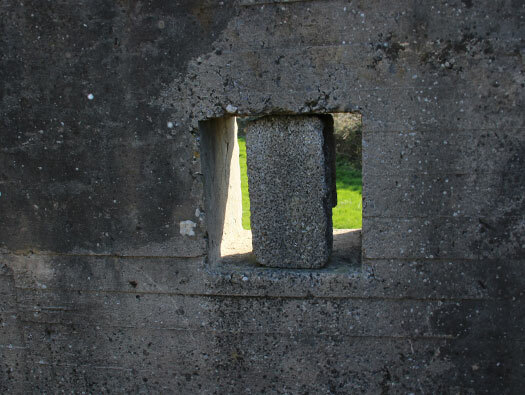 The guns would fire at targets with sand behind and the guns adjusted onto the targets. Me109 jacked up and ready to fire. Me109 guns in the nose section. 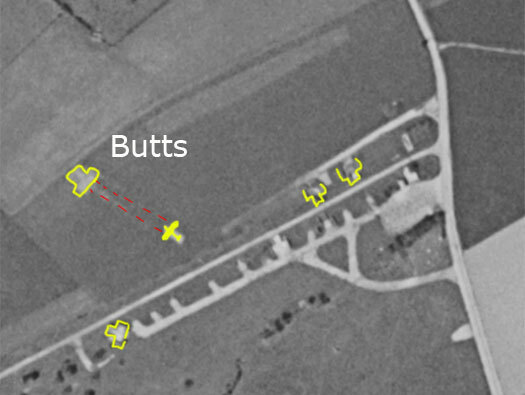 RAF cannon stop butts just like the one here. 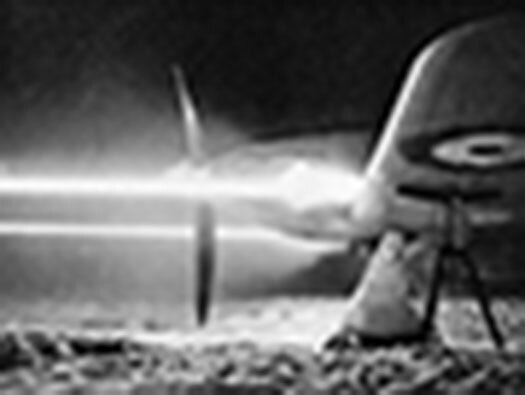 RAF Hurricane testing its guns. Adolf Galland's plane manoeuvring across a taxiway. 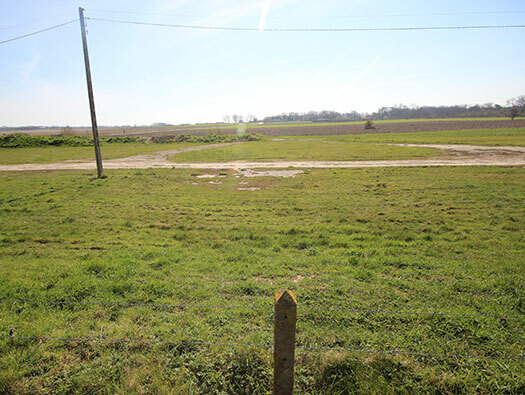 This aerodrome was used by JG26 and their leader was Adolf Galland. On 6 June 1940, Galland took over the command of III./Jagdgeschwader26"Schlageter" (III./JG 26–3rd group of the 26th Fighter Wing). 7, 8 and 9Staffel with an establishment of 39 Bf 109Es. Goering´s visit to JG 26 at Audembert on the Kanalfront, 5 December 1941. 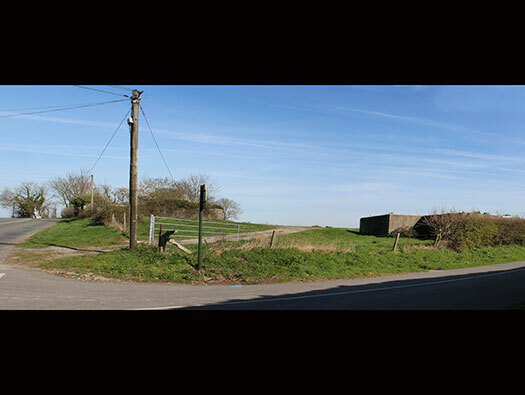 The building on the right could be their control tower?? Galland´s plane and Goering on a podium giving a speech. 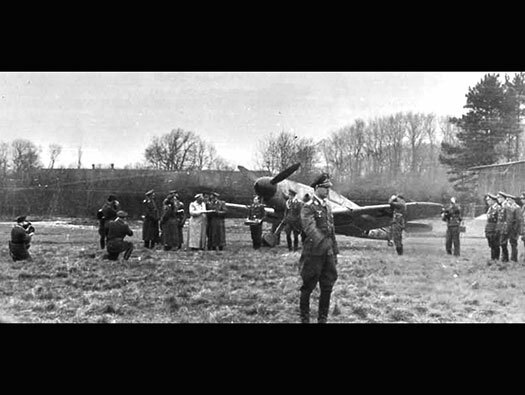 Goering´s visit to JG 26 at Audembert on the Kanalfront, 5 December 1941. 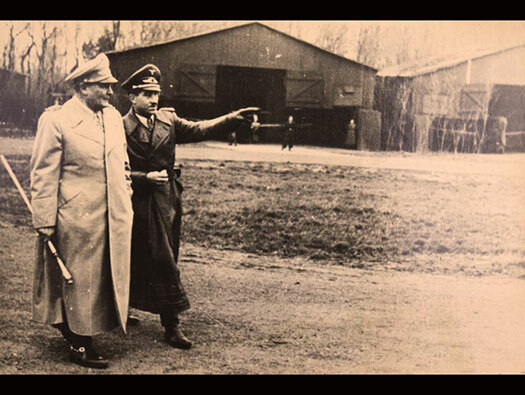 A candid shot of Goering discussing with Galland and an officer just wondering past the camera. The official photographers all around Goering and his entourage. 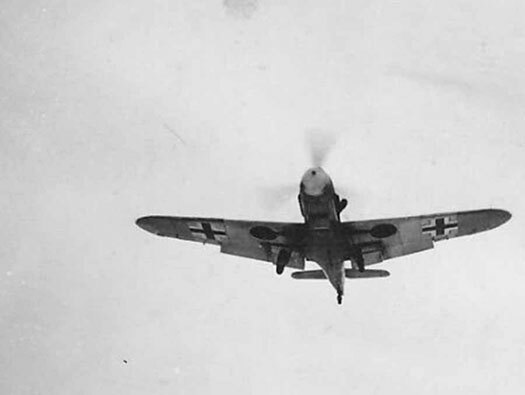 As the war progressed the Allied fighter and bomber force expanded to greater numbers and with the heavy bombing, the fighter squadrons were called back into the Germany. 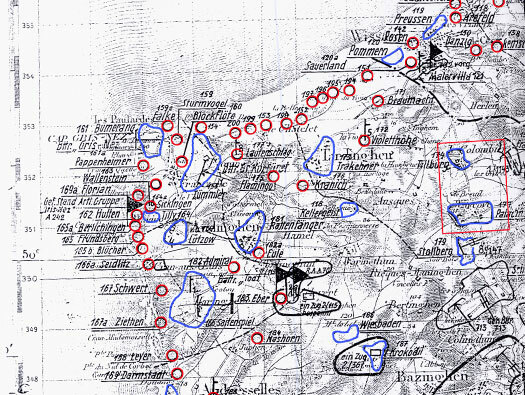 The aerodromes were not needed any more and their defences were taken over as part of the Atlantikwall, as can be seen on the main map. 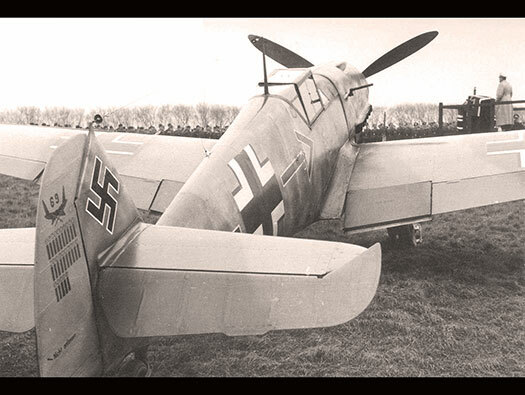 Click on the Image and a film clip will open of Galland and his Me109.